Dystany Spurlock -- Brave and Beautiful | New Growth Hair Magazine | We capture the culture of urban barbershops and beauty salons. While most teenage girls were hanging out at the mall, playing dress up, or watching silly movies, Dystany Spurlock was at the race track with her godfather. She watched his every move and dreamed of following in his footsteps. Dystany’s desire to ride motorcycles started when she begged her mother for a ride on the back of her motorcycle. On their way home, before they approached their last straight road, Dystany would yell, “Hit It, Mom!” and Dystany would get her required dose of speed. It didn’t take her mother long to figure out Dystany’s need for speed. After her early childhood experiences on motorcycles, Dystany was determined to figure out how to get on the track. Spending time with her godfather helped Dystany learn her way around the track. 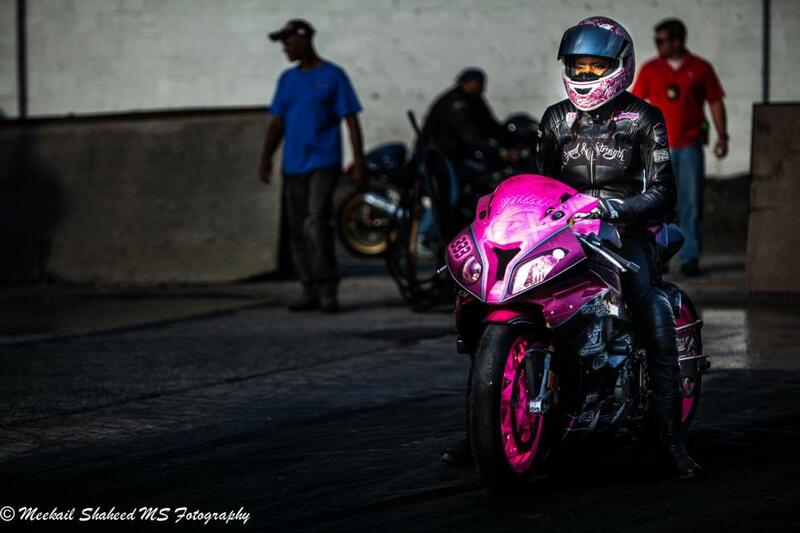 Since graduating from high school, Dystany turned her dream into a reality by breaking records with her motorcycle. 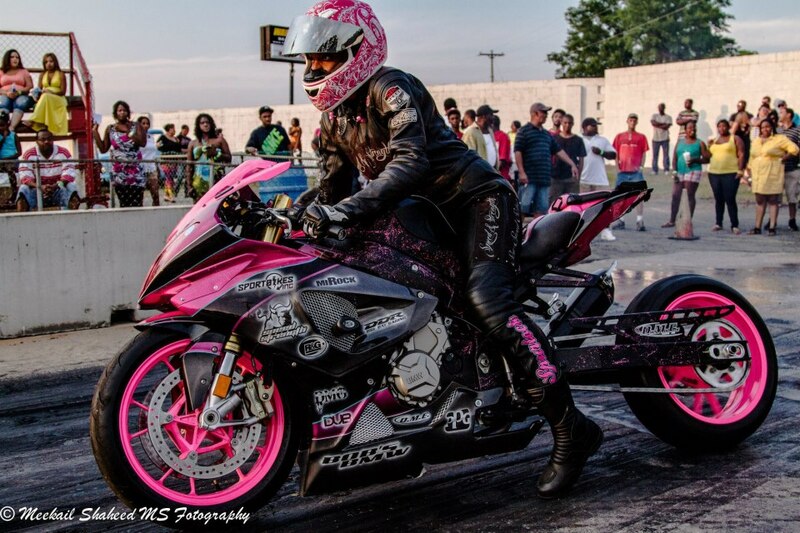 She has made her mark in the motorcycle world and is now transitioning into the NASCAR Circuit. Phillips: Please tell our readers how you got started in drag racing? Spurlock: When I was a little girl, I watched my mom ride her bike. I wanted to be just like her. I can remember asking her all the time time to take me out to ride. One day, she finally gave in. After my first ride, I was determined to figure out a way to get on the race track. When I got a little older, I asked my godfather to let me tag along with him at the racetrack. On weekends, he would bring me with him and I would watch his every move. My job was to figure out as much as possible so when I got my chance to get on the track, I would have a leg up on the competition. During that time, all I could think about was getting my opportunity to compete on the track. On my 17th birthday, my mom gave me the best gift in the whole wide world! She gave me a Suzuki GZR 70 Motorcycle. After a year of practicing with my bike, I had the opportunity to ride at the South Georgia Motor Sport Park. After that weekend, I knew that I was a biker. Phillips: In middle and high school, besides racing, what type of activities were you in involved with? Spurlock: You won’t believe me! Most people look at my small frame and just think that I’m a Girlie Girl, but that’s exactly why I tried out for the football team. The guys at my school [Fairfield Middle School] told me that girls can’t play football, but I felt differently. On the first day of tryouts, they asked me if I wanted to be the water girl and I said I’m here for the starting Safety spot. The coaches told my mom that they were looking for any reason to cut me, but they couldn’t find one. Playing football was easy, but dealing with the rumors was the tough part. Some people thought that I was gay because I liked to play football and others thought that I was just playing to be in the locker room with all the guys. All I wanted to do was play football and compete against the best players. I faced the same obstacles when I tried out for my high school football team. The high school competition was much tougher than middle school but I was determined to play. The guys were stronger, faster, and hit harder, but that didn’t stop me. Well, there was one time when I did think about quitting. Several of my teammates cut class and the entire football team was punished. The coach gave us the most grueling exercises and I was ready to quit after that practice. But, after talking it over with my mom, I decided to stick it out. Those lessons from the football field have stuck with me on the racetrack. Phillips: In 2013, you entered the NASCAR world. Why did you decide to make the switch? Spurlock: I can’t really say that I decided to switch to NASCAR. I was offered the opportunity of a lifetime and I couldn’t say no. The NASCAR opportunity didn’t happen overnight. It’s been a two-year process and I’ve learned some important lessons. My mom was right when she said people are always watching. I just didn’t know that the NASCAR people were watching too. I’ll continue to race my motorcycle while transitioning into NASCAR because I’m still in love with my bike. Eventually, I will focus all of my energy on NASCAR but it’s not like I’ll have to turn in my bike. I’ll still have my baby, we just won’t compete on the race track. Phillips: How do you spend your free time? Spurlock: I don’t have a lot of free time. Some of my fans think that I’m on easy street, but I am still working to reach my goals. During race season (March through November), I am racing two or three weekends per month, attending motorcycle shows, visiting schools, and attending community events. On top of my racing career, I still work a regular job. And after work I workout at the gym. So I spend most of my free time sleeping. But, I also enjoying traveling to new places, cruises, and trips to Atlanta. That city that feels like my second hometown. Phillips: You are 21 years old. Racing motorcycles and NASCAR take up most of your time, but does Dystany have time for love? What type of person would catch your attention? Spurlock: My mom read several of your interviews and warned me that you were going to ask me some tough questions. I was ready for all the other stuff, but I’ll give it a try! I am single and I was going to blame it on my schedule, but that’s not entirely true. If the right guy comes along, I’ll make time in my schedule. A lot of times, guys around my age tell me that I intimidate them. So I find myself approaching guys for conversation. A part of the reason that I’m single is that guys are afraid to talk to me. I guess I need a guy who is confident enough to approach me. I’d like him to have something he’s focused on in his life; maybe that will help him understand my passion for racing. If he has an outgoing personality, good conversation, and is a family-oriented person, then he will catch my attention. Now, this part is going to sound a little shallow, but it’s true! I’m 5’8 and, with my heels, that makes me taller. So I want a guy that’s taller than me. If he needs a chair to kiss me on the cheek, that’s just too much! Phillips: Back to your passion, what can our readers expect from you in 2013? Spurlock: I expect to make history in 2013! I’m on a mission to make things happen that haven’t happened before. Whether I’m on my motorcycle or in a NASCAR, I plan to make history. I post my progress all the time, so it’s easy for my followers to know what’s up with me. Spurlock: I would like to thank New Growth Hair Magazine for sharing my experience with your readers. Also, I have to thank my family, friends, supporters, and sponsors for helping me to realize my dreams. I feel fortunate for the opportunities that I’ve been provided and I look forward to new challenges in 2013 and beyond.